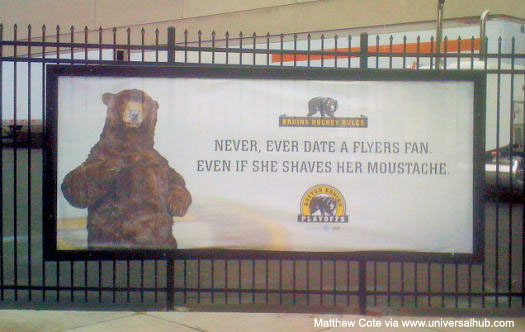 The Flyers have all sorts of problems. They are down 2-0 in their series with the Bruins. Seems like one of their players was bitten by Marc Savard. And to top it all off, their female fans need a shave or some Nair. I’m sure nobody expects the Flyers’ femmes to be as smoking as say, 24 hot chicks working out. Or even as fine as say, 33 tasty baseball babes. But come on — they can at least have less facial hair than the players skating around with their playoff beards. Right?